Private retreat for couples in Omaha, only 45 minutes north of Auckland. Our cottage is at the back of our beach house it is totally self contained and sunny. The perfect escape to forget your worries and relax, enjoy the sun and surf, walk the beach, read your book. Enjoy the BBQ , watch the stars. Or use the full kitchen, pick up some treats or enjoy a local winery. If you are boaties stand up paddle boarders, golfers, wine lovers, surfers, nature lovers its all here for you. Perhaps enjoy a short drive to some unbeatable restaurants, cafes, and vineyards, Matakana cinemas, wine bar, marine reserve..... the list is endless. A choice of 3 outdoor patio areas one very private and sunny, one for shade lovers too. Simple open plan studio designed for sun and privacy. Private BBQ deck or sunbathing. 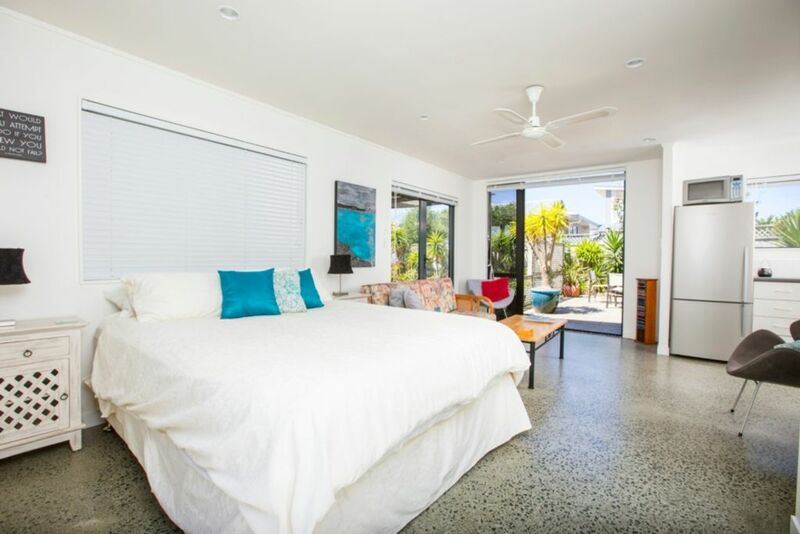 Flat walk to beach, boat ramp, jetty, golf-course, cafe, surf club, tennis courts, bird sanctuary. Comfortable smaller space. Handy to estuary and well equipped kitchen. Enjoyed a stay here. Well set up for a couple to stay. Smaller space but affordable and full kitchen for own cooking. Easy booking with owner. We had a very nice time. Susan was a wonderful host and the property was all that was promised. A perfect get away for a busy couple . If there was one complaint it was the WiFi was a bit in and out while we tried to watch the tennis but that was all . Other than that perfect. Many thanks Susan we will be back. Lovely little batch close to the beaches and nice walks. It was great we could bring our little dog but property isn’t fully fenced but he just came with us. The private outdoor area was lovely and very tidy, a thing I thought might be good for next time is having a few more extra towels/tea towels and a washing line otherwise it was a lovely place and we will be back! Thankyou for letting us stay ?? Lovely studio for two people. Lovely studio for two people. Very well-appointed, only a few minutes' walk to the beach. It was set up with everything we needed for a low-key break. The only slight thing would be the wifi connectivity isn't great. Well equipped and spacious studio, great location between beach and harbour. Well equipped and spacious studio, great location between beach and harbour. We very much enjoyed our stay. Very cosy accommodation, clean with the host great to deal with. Very cosy accommodation, clean with the host great to deal with. Litreally minutes from the beach.